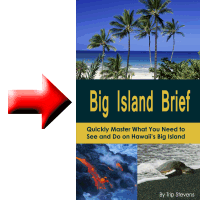 If you leave the Big Island without seeing a sea turtle, its your own fault. One of the biggest draws to Hawaii for me and my family are all the creatures. We love to see all the tropical fish, dolphins, whales, and of course the sea turtles. Sea turtles, called honu in Hawaii, are plentiful on the big island and you can find plenty if you are patient and keep your eyes opened. Sea turtle spotting is a skill that can be learned as you practice over time. Here are a few places that will kick-start your turtle spotting endeavors. ‘Anaeho’omalu Bay – This bay’s tranquil waters are extremely inviting, and not just to humans. The sea turtles come along the coast here to eat and rest. There is a trail that goes from the Marriott resort north to the Hilton resort where I have found many turtles. Some are hard to spot but there are plenty to be found. Kiholo Bay – This is a gem slightly off the beaten path. You get there by hiking in a mile or so. Bring plenty of drinking water. The public access road can be found on the west side of highway 19 between mile marker 82 and 83. Once you get down to the ocean, you can explore to the north or to the south. I have seen more turtles to the south but there are plenty in both directions. This area has a mixture of salt and freshwater and is a great place for snorkeling. 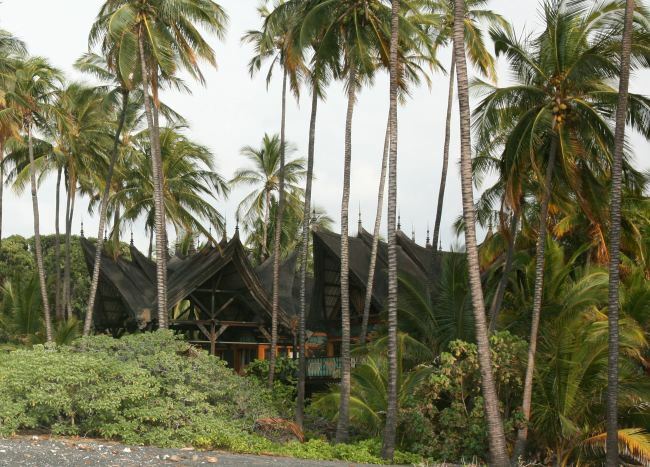 There are many private residences in this area so stick to the shore. One of the private estates you will see is “Bali House,” home of the owner of Paul Mitchell, the well-known hair products line. It’ is fairly extensive and quite unique, making it seem slightly out of place as you are walking along the beach. Kahuwai Bay – This is a shallow cove with lots of lava rock. It’s not a great swimming beach but a pretty reliable place to spot turtles. The major resorts here are Four Seasons and Kona village. To get there, head north of Kona on highway 19 and turn left on Ka’upulehu drive. Drive to the guard shack at the Four Seasons Resort and ask for public beach access. They will direct you on where to park. 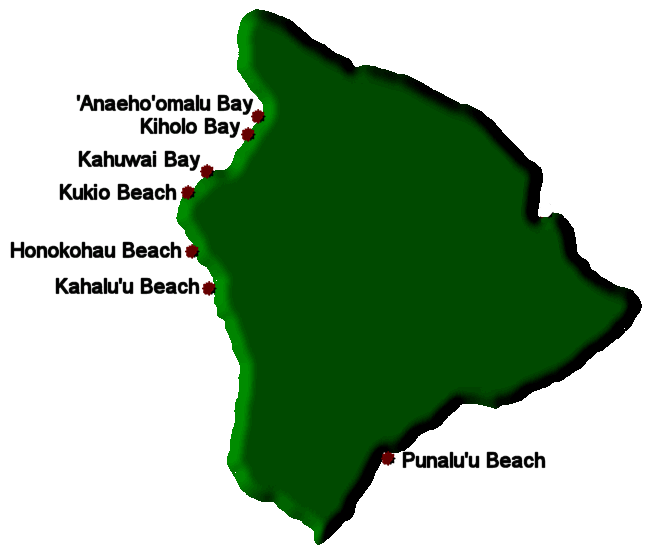 Kukio Beach – Just one bay south of Kawai Bay is Kukio bay, which features several beaches, including the very pretty Kukio beach, a popular wedding location. 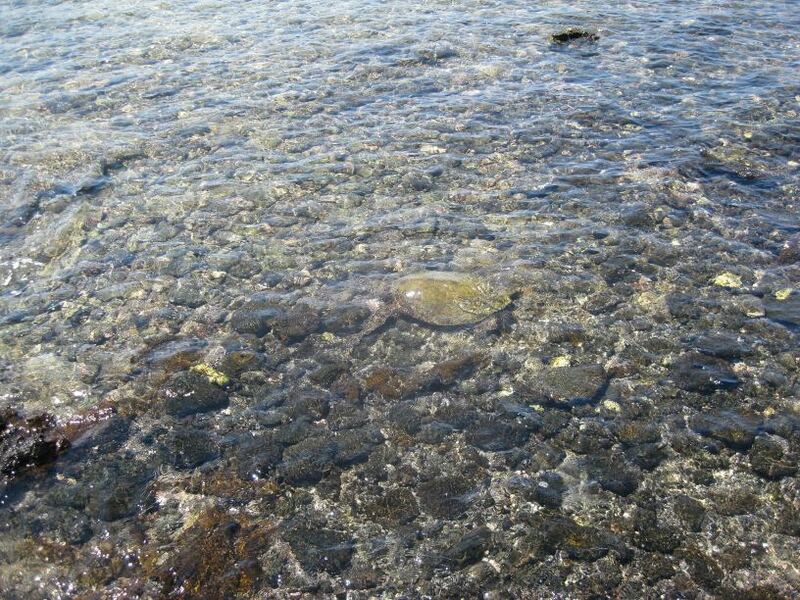 The beach itself is rocky and the water is murky, so it is not a great place for humans to swim. But it is an ideal place for sunbathing, and for spotting turtles. Kukio beach is about 13 miles north of Kona. Look for the “public beach access” road off of highway 19 near mile marker 87. Honokohau Beach – Sea turtles love to eat the seaweed and algae that accumulates on lava rock, and Honokohau Beach is the perfect place to do that. For optimum viewing and easier navigation, visit during low tide. Check the tide charts here. To get there, turn west onto Kealakehe Parkway between mile marker 97 and 98. There is parking at the harbor. While there, you can also visit the Kaloko-Honokohau National Historical park and learn more about Hawaiian history and culture. Kahalu’u Beach – This place is touted as one of the best places to snorkel on the island. While there are no guarantees in life, you have a very high probability of seeing some turtles here. In fact, some of the turtles are seen so regularly in this spot that they’ve been given names. Rocky and Lucy are the most frequent of the turtle visitors. Arrive before 10 a.m. on weekdays and 8 a.m. on weekends to avoid the crowds later in the day. Unlike many of the other beaches, this one has a food truck that serves lunch and shave ice. You can also rent snorkel gear from an organization called ReefTeach. There are picnic tables, bathrooms and showers. To get there, turn west onto Makolea street off of Ali’i drive in Kona. 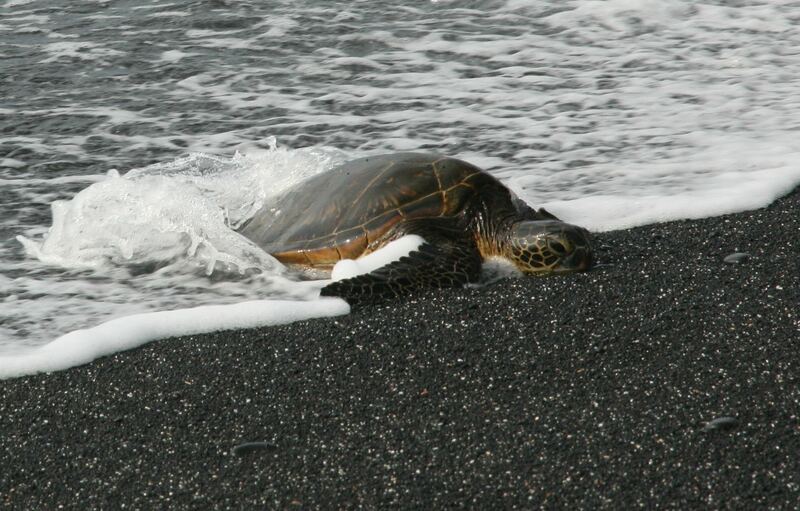 Punalu’u Beach – This is one of the more famous black sand beaches of Hawaii and a favorite spot for turtles. If you don’t see any immediately, be patient. You will probably spot a few out in the water. Punalu’u Beach is easy to access right off Highway 11, about 55 miles from Hilo and 65 miles from Kailua-Kona between the 55 and 56 mile markers. You will find restrooms, picnic tables and a snack bar on the beach. The trick to seeing turtles is not necessarily to be in the right place at the right time (like the tornado chasers) but to train yourself to spot the turtles. Whenever you are at the beach, you are in the presence of sea turtles more often than you realize. They are pretty easy to spot when they lay out on a white sand beach but much more difficult to locate when floating in the water surrounded by rocks. With time and practice, they become much easier to spot. 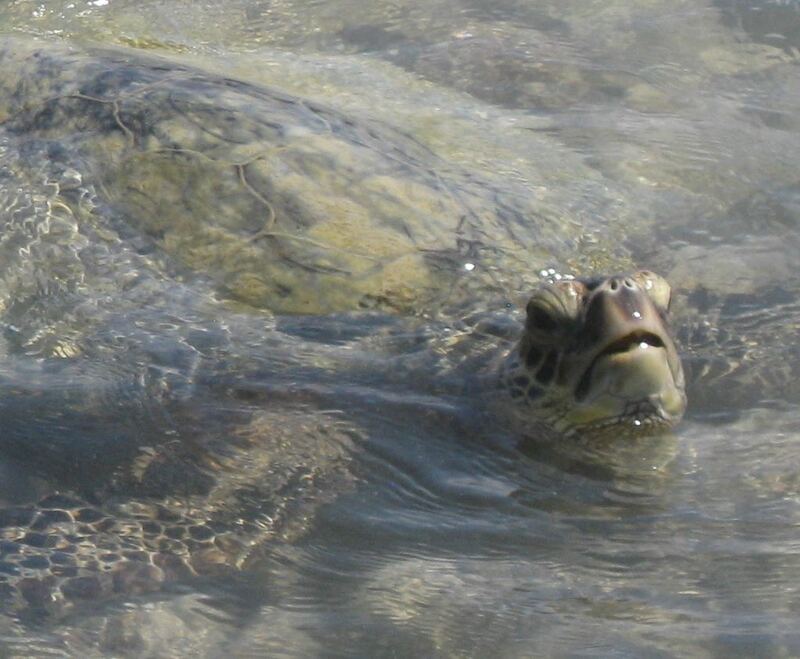 Like all Hawaii wildlife, don’t touch the turtles. Sometimes the turtles make it very tempting to do, but it is against the law, so keep your distance. In fact, you need to be at least 15 feet away. You may even get scolding by a lifeguard if you get too close, so resist the temptation and take lots of pictures instead.